Originally conceived for the Unfolding Pavilion call for installations, the piece of furniture that we displayed during the Biennale is a sort of prototype of an autonomous design object that could be produced serially. Gino, as we named it as a tribute to Gino Valle, is a piece of furniture made of coloured medium density fibreboards. It has two sides, with different features: one side is a proper shelf, that can host objects of different size and type (books, dvd, kitchen stuffs), the other side is a dolls’ house. It is composed by vertical and horizontal elements, some of which can be moved in different positions, changing the appearance of the piece of furniture. Gino’s original version has three colours: ocher, grey and violet. The partitions of the shelf are grey, the dolls’ house structure is violet while the vertical panel dividing the two parts is ocher. 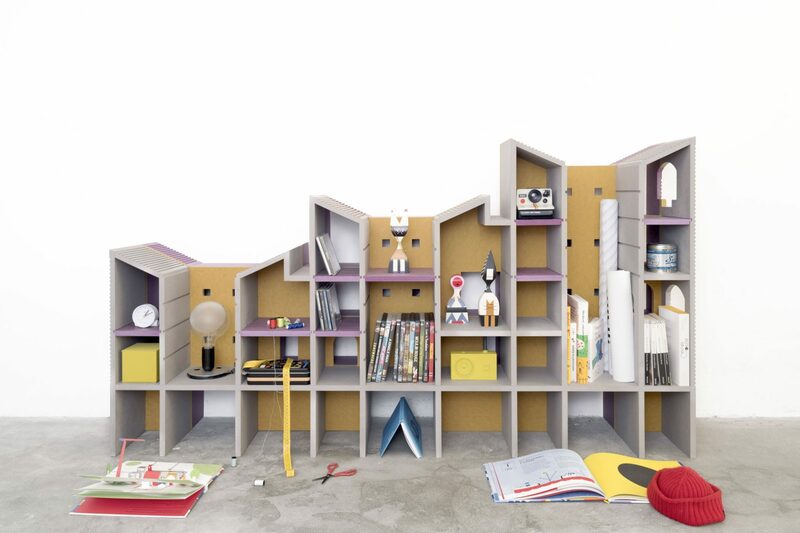 Thanks to its manifold concept, Gino can be placed in each room of the house: it can be a bookshelf in the living room, a cupboard in the dining room or a dolls’ house to play or to place toys. It can be a free standing furniture, useful to separate different areas in a unique space. It is a playful object that interacts with its context.